Chairman of the USG Board of Regents Neil Pruitt Jr. opens the Board of Regents meeting with a speech on Jan. 6 at the Student Center Ballroom on Georgia State campus. Last updated 1/12/15 at 10 a.m. The Board of Regents (BOR) announced Georgia State will merge with Georgia Perimeter College (GPC) on Jan 6. at 9:30 a.m. The consolidation will establish the largest university within the University System of Georgia (USG) with over 50,000 students. The merge will not be finalized until next year, according to board members during the meeting. 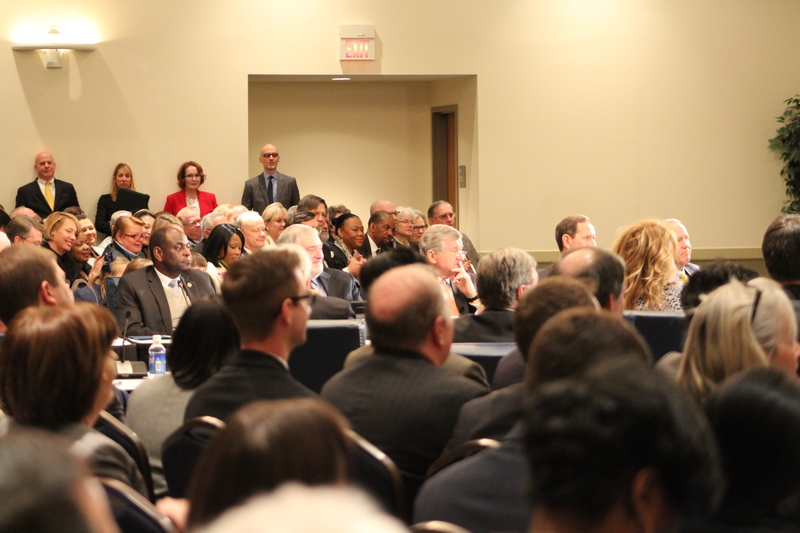 The board and visitors listen as Chairman Neil Pruitt Jr. opens the first Board of Regents meeting of the year on Jan. 6. Details regarding the future of GPC campuses are still to be determined. 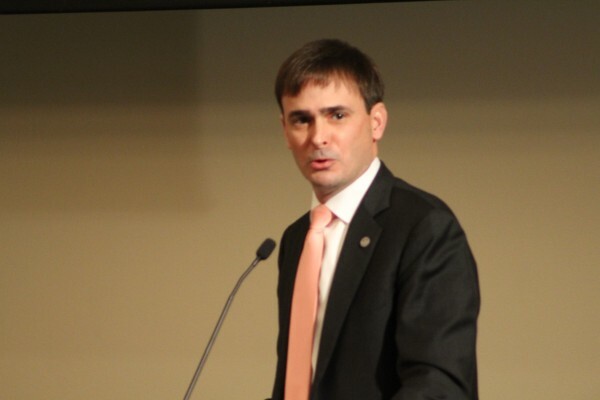 However GPC’s campuses will be renamed as additional Georgia State campuses, according to USG BOR Chairman Neil Pruitt Jr.
“[President Becker] mentioned wanting to keep some form of the brand,” Pruitt said. Pruitt also said GPC campuses will offer programs under the banner of Georgia State. “[Georgia Perimeter] won’t lose access to initiatives that are in place here,” he said. USG Chancellor Hank Huckaby said there are concerns about the drop-out rate at GPC but is optimistic about the merger’s effects on the retention rates of these students. “We are very positive about the track record of Georgia State University in the way they advise and monitor and support their students, and this will have a great impact on the students at Georgia Perimeter College,” Huckaby said. GPC currently offers a Transfer Agreement Guarantee (TAG) for students who meet certain academic requirements. This allows students to transfer to more than 30 four-year institutions upon completion at the college, according to GPC’s website. Huckaby said the options for GPC students such as TAG will not be affected because of the merge. Huckaby also said the Southern Association of Colleges and Schools (SACS) will vote in October 2015 to approve the merger. The USG BOR will meet again January 2016 to finalize the decision. The USG Board also finalized the resolution today to make Southern Polytechnic State University (SPSU) a part of Kennesaw State University (KSU). GPC’s Newton president of the Student Government Association (SGA), Sri Rajasekaran, said she is learning through the experiences of the SGA at KSU in dealing with their merger with SPSU. “I’m friends with the Kennesaw State SGA president and they were telling me about the challenges they were facing with joining SPSU. Even though it’s exciting, it’s going to be a tough process,” Rajasekaran said. Georgia State SGA President Lanier Henson said students should not feel anxious about the merger. “Trust that the administration will be working through it, and they’ll be fighting for our rights as students, but that their voice [the students] is important just as everyone else’s is,” he said. Henson also said any students with concerns should voice their opinions officially to the SGA so accurate information can be passed along to the USG Board of Regents. President Becker said he believes both college’s relationships will be transformed into something stronger and more formal as a result of the merge for those who use GPC as a pipeline to attend Georgia State. Becker also said Georgia State’s progress and improvement with student success contributed towards the decision of the consolidation. GPC Interim President Rob Watts said the consolidation of both universities will provide the college’s students with additional resources for academic success.